Legislation honoring Native American Indian ‘Code Talkers’ with medals was signed into law Wednesday, October 15, by President Bush. H.R. 4544, or the Code Talkers Recognition Act of 2008, honors Indian soldiers who used their languages to develop codes for the U.S. military during World Wars I and II. The act authorizes the recognition of every Code Talker with a Congressional Gold Medal for their tribe and individually with a silver medal duplicate. 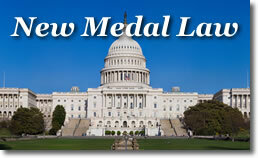 Bronze medal duplicates will be available to the public through the United States Mint. The legislation identifies members of the Assiniboine, Chippewa and Oneida, Choctaw, Comanche, Cree, Crow, Hopi, Kiowa, Menominee, Mississauga, Muscogee, Sac and Fox, and Sioux tribes as potential recipients of the award. Congressman Dan Boren from Oklahoma introduced and led the passage of H.R. 4544 in the House of Representatives on September 25. He had the help of 300 co-sponsors. "I am pleased that all Native American Code Talkers will finally be honored for their significant and brave contribution to our nation’s victories in the greatest military conflicts our world has ever witnessed, said Rep. Boren. Oklahoma Senator James Inhofe first introduced the Code Talkers Recognition Act in 2002 and has introduced similar measures in each Congress since the 107th Congress. In the 109th Congress, the U.S. Senate passed the legislation by unanimous consent. Last year’s measure gained passage in the Senate with 79 bi-partisan cosponsors. The measure finally succeeded in the 110th Congress as Senator James Inhofe pushed for the passage of H.R. 4544 when it came to the Senate floor. It passed by Unanimous Consent on September 30. "Code Talkers from these tribes are true American heroes whose accomplishments have for too long been forgotten. This legislation finally recognizes and honors a group of people who made a real difference in the fight for freedom during World Wars I and II," added Sen. Inhofe. Chief Pyle of the Choctaw nation expressed his appreciation for the efforts of everyone who helped pass the bill. "The Choctaw Nation is very proud that Code Talkers are to be recognized with Congressional medals," Said Chief Pyle. "I am thankful for the tremendous teamwork of people from across the United States who contacted their Senators and Congresspersons to request support for this legislation," he added. In the event of the death of a Native American code talker who had not been awarded a silver duplicate medal, the Treasury Secretary may award a silver duplicate medal to the next of kin or other personal representative of the Native American Code Talker. Why is there no narrative for the Special Commemorative Medals – Women At War, 1941 -1945 to 1991 -1995 and Women on the Homefront. These were 50th Anniversary Commemorative medals – but they do not come with a description or narrative. Could you please provide me with this info or where I can research it.